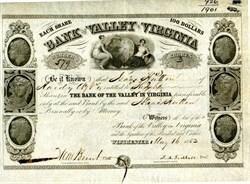 Beautiful engraved certificate from the Bank of the Valley in Virginia in 1853. This historic document was printed by the Underwood, Wald and Spencer Company, Phila. and has an ornate border around it with a vignettes of allegorical figures. This item has the signatures of the Company’s President, T. A. Tidball and Cashier, H. M. Brent. The Bank of the Valley in Virginia was established in Winchester on January 17, 1818 with branches in Leesburg, Charlestown, and Romney. The bank closed during the Civil War and then reopened afterward as the Shenandoah National Bank on January 9, 1866. In the 1980s, the bank was renamed First American Bank.